The safety of our students is our first priority, and we are pleased to provide our school family with transportation services to and from school. Please help your child understand the importance of following the rules; riding the bus is a privilege, and we want it to be a safe experience for everyone. We provide transportation through Teton Stage Lines to all students in grades K–6 who reside within 15 miles by road of the school at no charge. We provide this service before and after school, but we do not have a midday run for our kindergarten students. Riding the bus is a privilege, and we expect our students to assist district staff in ensuring that buses remain in good condition and to help ensure safe transportation by adhering to behavioral standards established by school transportation. Students who compromise the safety of others will lose the privilege of riding the bus. We require all bus riders to enroll on the bus roster with our school transportation coordinator. Please contact us to complete this process. Unenrolled students may not ride the bus. Do not contact Teton Stage Lines for authorization. To ensure receipt of your email request, please cc: your email to cherip@monticellomontessori.com. Please arrive on time to your child’s bus stop. We request your patience as stop times are approximate, and the drivers may arrive a few minutes early or late. For the safety of the students, we will return students not picked up at the bus stop on time to school and assess parents a $65 charge for the return trip. Buses cannot remain at the bus stop for longer than two minutes. Drivers will wait for up to four minutes at the final route stop before returning your child to the school. We will not permit any student returned to the school the privilege of riding the bus again until all fees are paid. If you would wish to grant permission for your child to get off the bus and walk home from the bus stop without a parent or guardian present, please complete the parent authorization to walk to/from the bus stop and return it to our office. We will not permit K–3 students to walk unless accompanied by an older sibling. We require a new form every school year. To pick up your child after school, please use the carpool lane and remain in your vehicle. Office pick-up is only for students who must leave before the end of the school day. If all families will follow the guidelines below, we can complete student pick up within 10 minutes of dismissal time. Place a printed name sign in your vehicle where it is easily visible to school staff. Use the carpool lane and remain in your vehicle. If you need to come into the school, please park your car in the parking lot and then come into the office. Do not park your vehicle in the bus loop. When the carpool attendant sees your vehicle and the family name, we will deliver your child to your vehicle. Interested in carpooling? Please contact the office for a list of families interested in carpooling. Please note that we will have new bus schedules starting on Monday, December 10, 2018. For your convenience, we are listing the new schedules below. 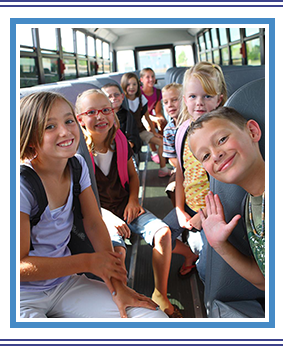 To enroll your child for bus services, contact us. Do not call Teton Stage Lines.